Our group swimming lessons and classes feature levels for varying abilities to help make for a successful swimmer. Australian Olympic Swimmer, Ross Seymour, designed our group swimming lesson curriculum to develop and enforce proper swimming technique. We offer group swimming lessons in Aurora and Naperville, Illinois and other surrounding areas. Our swimming lessons have a maximum of 4 students per instructor, providing an ideal learning environment where children can learn while still having fun. Our swimming school consists of 10 levels that are designed to enhance your childs swimming skills. Our first four levels of swimming lessons are taught in our teaching pool, and levels 5-10 are taught in our 25 yard , 9 foot deep competition-length lap pool. We believe that a child has met the goal of becoming “water safe” when they are able to pass our “Green” level and complete 400 yards continuously in our deep-water lap swimming pool. 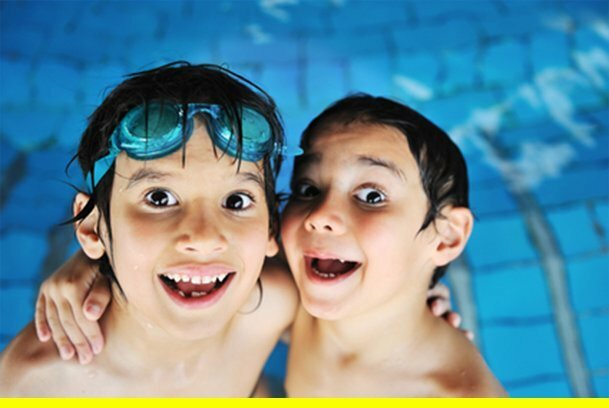 Our higher level swimming classes further develop and refine your child’s skills in the various strokes. Our group swimming lessons are recommended for children and toddlers ages 3 and up of all swimming abilities. Our swimming program will not only teach your child how to be safe in the water, but will also prepare them for neighborhood, club, school swim teams, and beyond. Our (16 or more) package is the most economical. All swimming lesson credits are valid for 1 year from the time of purchase. Focus on comfort and submersion. Mouth and nose bubbles, independent submersion for 5 seconds. Focus on forward movement on front. Learn the front float and independent front torpedo. Focus on forward movement on back. Learn to back float, the independent back torpedo, and front to back flip ups. Focus on forward movement with arms. Learn freestyle, backstroke, and side glide. Introduction to body rotations and breathing. Learn single switch freestyle and backstroke. Perfecting the body rotations and breathing. Learn to build endurance while perfecting single switch freestyle and backstroke. 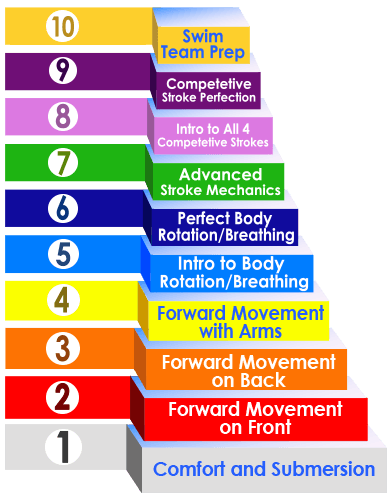 Focus on endurance and advanced stroke mechanics. Learn the triple switch freestyle and backstroke. Introduction to all four competitive strokes. Introduction to breastroke and butterfly. Perfecting all four competitive strokes. Building endurance, advanced stroke mechanics for breastroke and butterfly. Learn flip turns, competitive diving, swim team sets, and race strategy. What Swimming Level Do I Pick? We offer free evaluations every weekday, as well as Saturday mornings, to determine the proper group level for your child. Please make sure to bring your own towel and swim suit to the swimming classes. Goggles are not mandatory; however we strongly recommend using them. Evaluations are by appointment only. You can pre-register here to schedule an evaluation for your child.